We are a regional organization of admirers of Jane Austen and her writings, founded in 1977. Our group meets four times a year, mostly in the Greater Portland or Brunswick area, to hear speakers, discuss Austen’s work and life, celebrate her birthday and enjoy the company of other Janeites. We are proud of our summer “Boxhill picnic”. 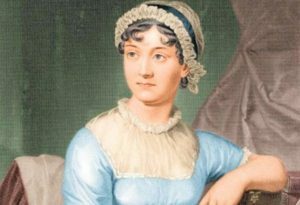 Anyone who has chuckled at, appreciates or has been moved by Austen’s novels will find a cordial welcome at our meetings. You can also visit us on Facebook: https://www.facebook.com/janeaustensocietyofnorthamericamaine. 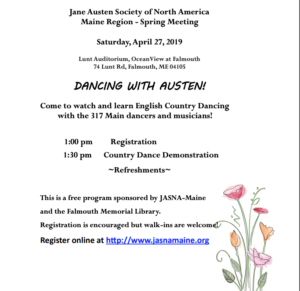 JASNA-Maine is one of more than 70 regions which comprise the Jane Austen Society of North America. Membership in our parent group confers regional membership. One may attend the regional meetings as guests. To learn more about JASNA or to join, see http://www.jasna.org/membership/index.html. You say you’ve never heard of English Country Dancing? You’re in good company. But, if you’ve seen Pride and Prejudice, Emma, or Sense and Sensibility at the movies, you have indeed seen it! Fear not, English Country Dancing (ECD) is not some obscure relic! While this traditional form of group dance has been around for several hundred years, it’s still thriving today – there is ECD happening in communities all around the United States. If you can walk and know the difference between your left and your right, you already have much of the basic knowledge you need to get started with ECD. Most of the movements are simply based on a walking or skipping step. Dancers move in a number of specific “figures,” sometimes holding hands, sometimes by themselves. Each dance will be taught and prompted by a “caller” and every movement is called in time with the music, so you don’t need to rely on your memory alone to know what to do. Beginners are welcome and encouraged! Partners are not necessary, since the tradition changes partners often. And then there’s the music – beautiful tunes that will make the heart swell – sometimes sweet, sometimes stately, and sometimes absolutely driven with a pulsating beat. All of this combines to make ECD energizing, mesmerizing, social, and just plain fun! Beginners welcome.